In Brazil, approximately 16 per cent of women with professional occupations (more than 6 million people) held jobs as domestic workers in 2014. This occupation is historically associated with poor working conditions, such as lack of legal registration (informality), low wages and high weekly working hours. It is also a unique occupation because, until 2015, it was not governed by the same labour rules as all other private occupations. Other private occupations are subject to the Consolidated Labour Laws from 1943. Instead, labour rules for paid domestic work were set by a specific law (Law No. 5,859) in 1972 and by the 1988 Federal Constitution. The reason for this distinct treatment is the nature of the job performed by domestic workers, usually at the employer’s home and very close to their family. In April 2013, the House of Representatives approved an Amendment to the Constitution (Emenda Constitucional—EC—72) that guarantees labour rights that other employees already had access to. Immediately after April 2013, the only practical effects of the legislative change were the limitation of working hours (up to eight hours a day and 44 hours a week) and the obligation to pay overtime. Other rights contained in the Amendment depended on specific legislation. Nonetheless, even before the law was approved there was intense debate in the Brazilian press highlighting all the possible consequences of increasing the rights of domestic workers. There are two ‘types’ of domestic workers in Brazil: the mensalista (monthly worker) and the diarista (daily worker). The mensalista usually works for the same household the entire month and receives a monthly wage; this is the most common arrangement for all jobs in Brazil. On the other hand, the diarista usually works for two or more households during the week, one or two days in each household, and receives daily payments. It is important to note that only mensalistas are defined by law as domestic workers. Therefore, labour rights are not guaranteed for diaristas. 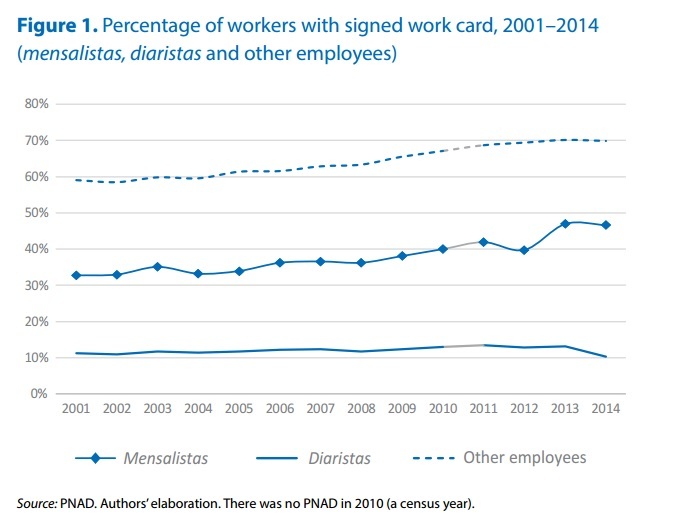 Figure 1 shows the evolution of the proportion of mensalistas and diaristas with formal labour contracts, based on waves of the National Household Sample Survey (Pesquisa Nacional por Amostra de Domicílios—PNAD) between 2001 and 2014. This is an annual survey with a reference period in September. We can see an upward trend for monthly workers (dotted line) throughout the period, with a sharp increase between 2012 and 2013 (7 percentage points). For the daily workers (continuous line), the proportion is stable. For the sake of comparison, we also depict the same information for other female employees. The proportion of these workers with formal contracts is almost twice that of the mensalistas. The proportion of other employees with formal contracts also increased during the period, but there is no path-breaking at the end. To evaluate whether this increase in formality among mensalistas is related to the legislation reform, we perform a difference-in-differences (DID) analysis using data before (2012) and after (2013 and 2014) the Constitutional Amendment, considering as a control group other female employees in the service sector. We weight the estimating equation by the probability of being a domestic worker (the propensity score), a strategy known as inverse probability weighting (IPW). The results indicate that the Constitutional Amendment increased the probability of mensalistas having their work card signed. We also identify a decrease in the number of their weekly working hours. Adjusting domestic workers’ hours of work was probably the first step taken by employers, particularly for those whose employees live in the household. We identify no impact on the wages of mensalistas. We also investigate whether the Amendment had general effects on the labour market. There is no clear evidence that it decreased the probability of a domestic worker being a mensalista. On the other hand, the probability of domestic workers being a daily worker increased. In addition, there is an increase in the probability of being unemployed. Therefore, it is possible that at least part of the reduction in informality among mensalistas is a consequence of migration to informal jobs or to unemployment, rather than an increase in the absolute number of legally registered workers. This blog was first published in One Pager No. 336. Costa, Joana, Ana Barbosa, and Guilherme Hirata. 2016. “Effects of Domestic Worker Legislation Reform in Brazil”. IPC-IG Working Paper 149. Brasília: International Policy Centre for Inclusive Growth.